Oracle v. Google: Klingon and copyrighting language. Can Copyright Protect a Language? What a big software case could mean for Klingon speakers. Could a court ruling throw Klingon in jeopardy? 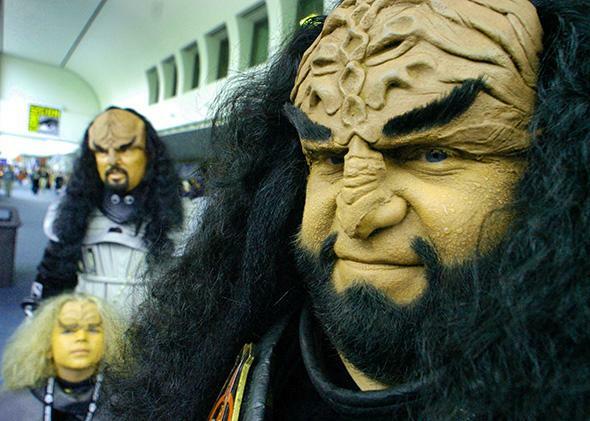 Above, Klingon costumes at Comic-Con in San Diego in 2004. Illustration by Slate. Photo by Sandy Huffaker/Getty Images. With the rumors about the third Star Trek film starting to fly, it’s high time to talk about how the Supreme Court is about to rule on whether it is illegal to speak Klingon. You may have heard of the case Oracle v. Google, a clash of software titans ongoing for the last five years. The Supreme Court is currently deciding whether to take on the case, and last week the Department of Justice filed a significant brief siding with Oracle and recommending leaving intact the decision of the appeals court in Oracle’s favor (though the government is perhaps not fully united on this, as one recent article suggests). Many are describing this case as involving a very technical issue of “copyrightability of application programming interfaces, or APIs.” But the implications for sci-fi argot are perhaps less widely discussed. And though the effect on jurisprudence for alien languages will presumably not be terribly widespread outside a fictional universe, the wrong result will have real and serious consequences for the nonfiction world, potentially cutting off decades of innovation in all sorts of industries. Here’s the story. Twenty years ago, Oracle’s predecessor, Sun Microsystems, developed a new programming language called Java. Along with the programming language itself, Sun wrote a package of software tools, the “Java API,” designed to work within the programming language. Obviously, there had to be some way to instruct the Java API to perform certain operations upon request. So Sun invented a set of command words that the Java API would recognize as requesting certain operations. Each word came with a set of rules specifying the context in which the word was to be used. The lawsuit arose out of Google’s Android software, which totally rewrote the implementing code but copied a large portion of the declaring code—that is, the command words and rules of the Java API—in order to make it easier for programmers already familiar with the Java API to write programs for Android. Oracle said that this amounted to copyright infringement and sued Google. So according to Oracle, copyright can protect a language and prevent others like Google from speaking it. That’s the connection of the Oracle v. Google case to Klingon and other constructed languages like Esperanto or Lojban: If broadly read, the ruling against Google, which is where the case currently stands, could also deem the speaking of such languages to be copyright infringement. And it’s not just the linguists and Trekkies who should be concerned. Invented languages are the foundation of all sorts of innovation. Most prominently, computer networking technology depends on languages, like the Wi-Fi protocol, so that multiple computers can communicate and understand one another. Those protocols also include formally defined commands (vocabularies) and rules of operation and syntax (grammars), making them languages almost exactly on par with the Java API. Other fields, such as medicine, engineering, and sports, rely on well-known jargon for efficient communication of specialized concepts. It may seem a little confusing to describe the Java API command words as forming a “language” when they are already written in the Java programming language. But this Inception-like “language within a language” is actually pretty common: The English language, for example, is built out of a language of vocal sounds called phonemes, and English is the basis for, say, the language of chemistry. Oracle, the appeals court, and the Department of Justice think that owning a copyright on a language isn’t a big deal, because others can always invent new words rather than copying. According to the appeals court, for example, “the Sun/Oracle developers had a vast range of options,” so “designing the Java API packages was a creative process” that could be protected by copyright. The existence of “alternative” languages, said the appeals court, makes it reasonable for Oracle to own one of them. The problem is that there are “alternatives,” and then there are actual alternatives. Certainly you could invent an alternative Java API language, or an alternative Klingon language, or an alternative Wi-Fi protocol. All of these would be perfectly valid languages—and they would be totally useless for their intended purposes. Speaking alt-Klingon on Kronos gets you killed or, worse, condemned to the dilithium mines of Rura Penthe. Speaking alt–Java API or alt–Wi-Fi has equally futile (albeit less deadly, one hopes) consequences: Your laptop can’t get on the Internet, your computer program doesn’t run. The real worry is to competition, because Oracle’s theory of copyright would turn a law about creative novels and movies into a tool of business monopolists. As my colleague John Bergmayer points out, compatibility is important to a whole host of industries, such as open-source word processors that read Microsoft Word documents, car replacement parts that need to be certain shapes to fit, or third-party toner cartridges that have to replicate software codes to work with printers. And consider the ongoing case Synopsys v. ATopTech, involving software for designing computer chips. The process of chip design involves two stages, the place-and-route stage where the circuits are actually arranged, and the verification stage, where the circuit design is checked to make sure it works correctly. “Synopsys currently possesses dominant market power in the market for ‘verification’ software,” alleges ATopTech, which makes place-and-route software. Since ATopTech’s software “must be interoperable with verification software,” ATopTech uses some command names that Synopsys’ verification software expects and some similar output file formats. Synopsis then sued ATopTech for copyright infringement based on using those input and output formats. And what case did the two parties cite in their very first fight over this copyright issue? Oracle v. Google. It is this outgrowth of the Oracle v. Google case that worries me: that a company like Synopsys could use copyright to stop competitors from speaking the language of that market. That the standardization of languages and protocols that are the foundation of the Internet could become balkanized by claims of ownership and intellectual property. That the mere speaking of a language, be it Klingon or code, could subject one to violation of federal law. According to one Klingon proverb: “Ending a battle to save an Empire is no defeat.” By deciding to take the Oracle v. Google case and to reject Oracle’s misguided view of copyright, the Supreme Court may end Oracle’s software battle, but it will save an empire of industries built on sharing and freedom of communication, on interoperability based on common languages. That, certainly, would be no defeat.